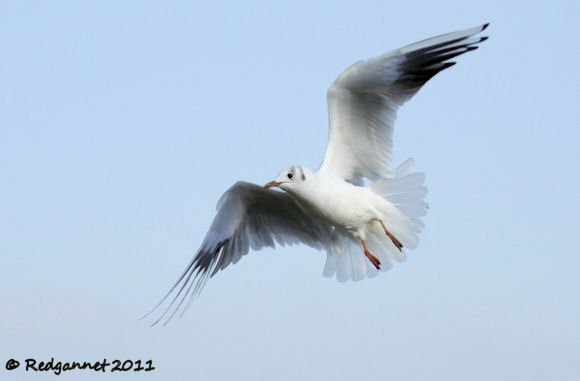 The Black-headed Gull, Larus ridibunus, is similar in many ways to Bonaparte’s Gull, Larus philadelphia of North America. 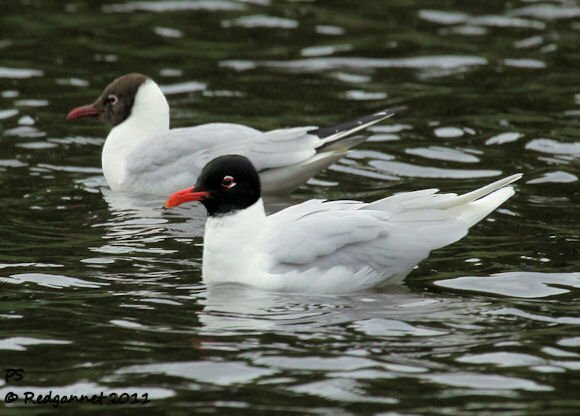 They are both small “black-headed” gulls which take two years to reach maturity and retain their black, immature tail bar through their first winter and summer. The white wedge on the leading edge of the outer wing is another shared feature. Being part of the polyphyletic Larus group ( a group that does not contain the most recent common ancestor and whose common feaure developed seperately), makes them the grit in the cladistic (natural ancestrally related grouping) vaseline however and a new genus has been proposed, making the binomials, Chroicocephalus ridibundus and C. philadelphia, but until such a time as my software updates, I shall continue to know them as Larus (this is a personal obstinacy and does not necessarily reflect the view of The Management). I hope this defiance of the AOU won’t affect my US visa application. 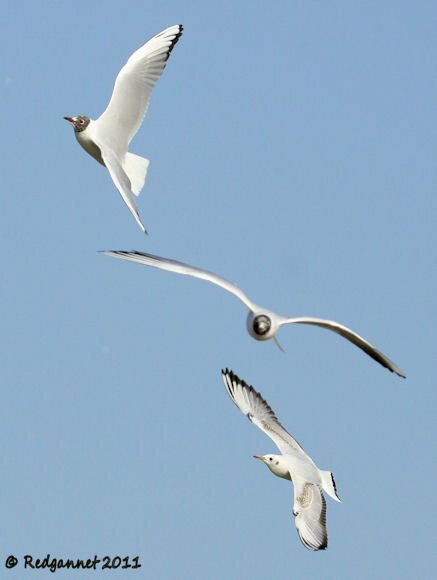 Perhaps where the form asks if I have ever indulged in criminal or terrorist activities, or whether I have more than $10,000 in negotiable monetary units, they should include a section inquiring as to my thoughts on the new classification and sequence of genera and species adopted for gulls of the subfamily Larinae. 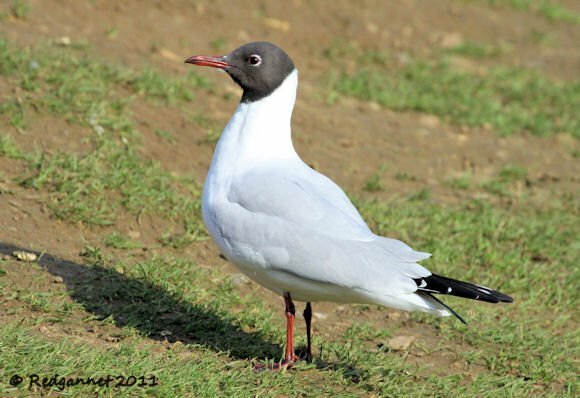 This gallery features the Black-headed Gull and shows a few variations of plumage that could be found on an early March afternoon in Kent, UK. 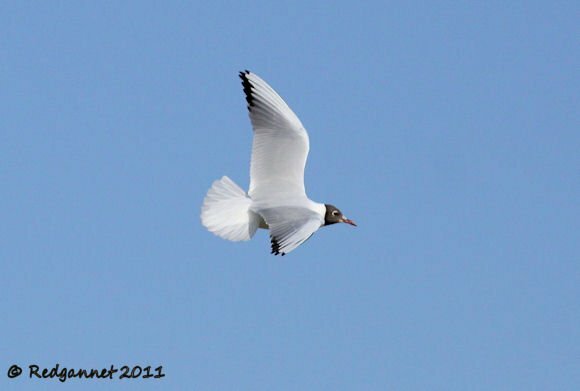 Note the long legs and red bill of the breeding-ready Black-headed Gull below. Bonaparte’s Gull, shows a smaller, dark bill and shorter legs. Note also that despite the name, the hood is actually dark brown, but often appears black even in decent light. Some of the birds have already completed the change to summer dress by the beginning of March, some have yet to start and others are in transition. 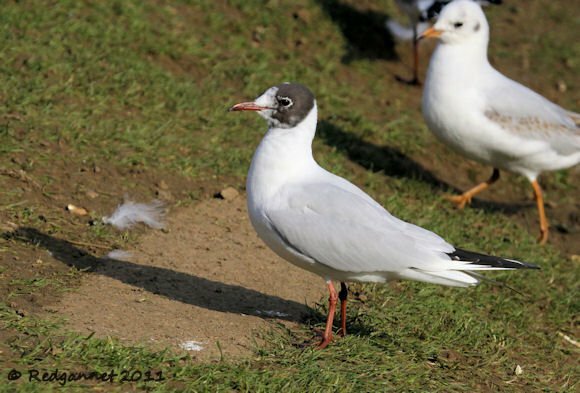 Below is a first winter bird showing immature markings in the wings and the duller orange in the legs and bill. The markings on the wings reduce and take on the clean look of the adult as summer approaches, but the tail bar is retained until the next winter. Many first summer birds may develop a partial hood and acquire the deeper red bill and leg colour of the adult. 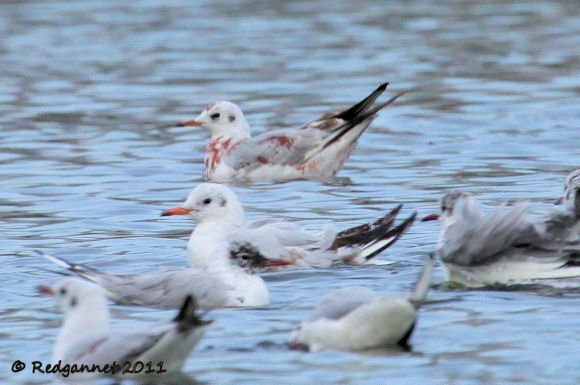 Note the dark lining beneath the wing of the winter plumage adult below, a feature missing from the Bonaparte’s Gull. The clean wings and deep red of the individual below would indicate an adult in transition between winter and summer plumage. Compare to the first winter bird behind. 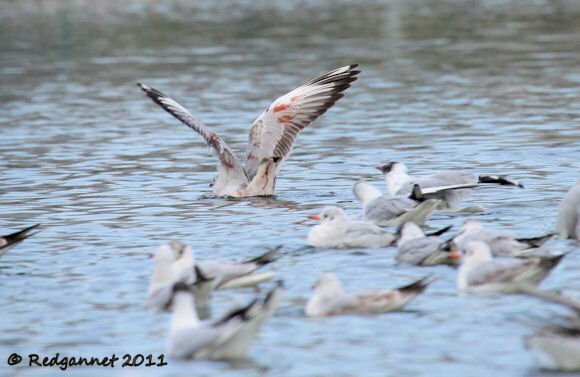 They are very common to abundant within their Palearctic range and are the gull most associated with inland sites, often appearing in towns and cities. They are summer visitors to much of northern Europe, wintering in the Mediterranean with resident populations favouring western Europe. In India and the Far East, they are winter visitors from China and Russia. They breed noisily and colonially at large lakes with reed beds and marshy areas. The individual below was seen on a trip to Dubai in March. It has strange red smudges which I am unable to explain. The juvenile bird has rust-coloured markings on the head and wings, but these marks are red and extend to the forehead, breast and even the vent. I don’t think it is blood. The bird came to a lake with the rest of the flock to bathe. Its feathers did not look matted as might be the case with blood, nor did it wash away. It is probably a stain, but he bird must have been very acrobatic in order to get such a staining pattern. It is unlikely to be an abberation of plumage, unless you know better. Answers on a postcard please. 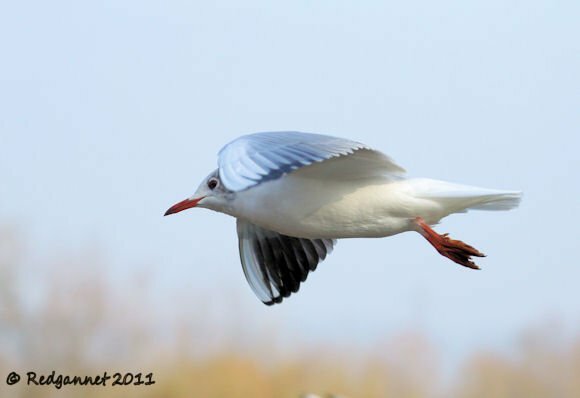 A sometimes seen, but often overlooked species in the UK during the winter is the Mediterranean Gull (a 3-year bird that has escaped the attentions of the AOU classification commitee). In the colder months, it is best seperated from the adult Black-heads, with whom it often associates, by its slightly larger size and the lack of dark flight feathers. 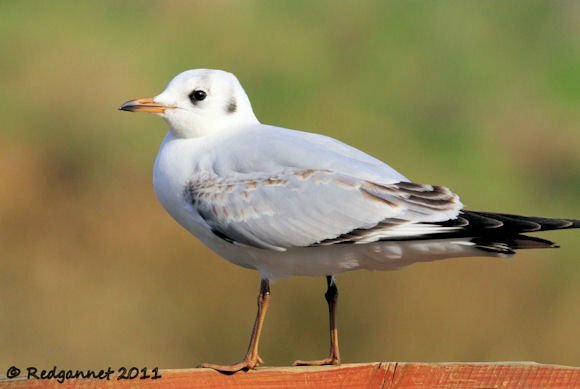 Above, in a comparison of summer birds, the differences are striking and the black-headed Gull’s head can be seen to be brown which is why the Mediterranean Gull gets the Larus Melanocephalus moniker. If you liked this post and want to see more great images of birds make sure to check out 10,000 Clicks, our big (and growing) page of galleries here at 10,000 Birds. This post has been submitted to Bird Photography Weekly #146. Go check it out! Redgannet, I must say, this is one heck of a post! strange with those red spots on the bird. Maybe a genetic flaw? I agree, great commentary and photos! I imagine that this pink-tinted gull fed off commercial salmon/shrimp etc., during moult, ingesting large amounts of synthetic astxanthin. Why only some birds are genetically programmed to metabolize and deposit this colour is interesting. Peregrine Falcons: Too Much of a Comeback?